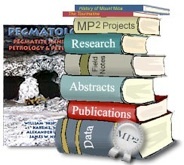 As our research and projects develop, the MP2 Research Group invites you to peruse some of our work, related travel, and images. Wherever possible, we will detail our images and data, but reserve the right to limit such information. We have currently divided this section into four categories (see below), but will be adding more in the future. Our seal of authenticity guaranties original information, work and projects. If you would like to contact the Group for more information, make comments, contribute or request information, you will find all of the contact information under the Staff or Students pages.